It’s wonderful the type of concern we as a nation have for others. Whenever tragedy strikes, it’s so encouraging to see people ready to help those in need. Great examples are when hurricane Katrina struck and in the case of the earthquake in Haiti. People’s love and kindness over flowed in an abundance. Now with the recent tragedy in Japan, again there is an overwhelming response from people as to what they can do to help. However, I think sometimes we forget our own country. The US government is broke, or worse yet in deplorable debt. We are in a recession. Gas prices are way high. Food prices are going up. We have people are in need right in this country. Ever heard of the Tent Cities? There are scattered throughout the US. Many are homes to people who choose to be homeless but a great majority are people who lost their homes when they could no longer pay their mortgages, or got let go from their job. Where is their assistance? It’s truly shocking that with a title like “land of opportunity” , we still have people (hard-working people) in dire straits. Nevada’s unemployment rate jumped 60% from 2007 to 2008. Now the Tent City that resides there is the home for 170 people and counting. The residents are a mixture of those who have been homeless for many years and those who are new – evicted by the foreclosure crisis. The sufferings have started either from foreclosures or unemployment with one linked to the other. Right across the country tent cities have mushroomed in Columbus, Chattanooga, Fresno, Portland, Seattle etc. 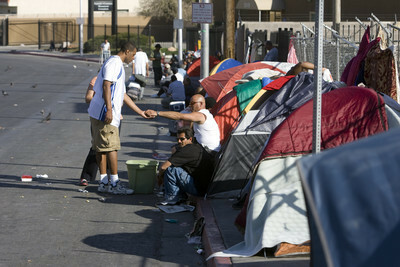 The officials organizing the tent city in Reno said that when things got very bad they decided to set up this tent city. This didn’t just occur. This has been happening everyday. These people live this. The irony is that on the other side is the human indulgence of the casinos. Still this is happening everywhere. Now funding for things like Planned Parenthood and PBS broadcasting have stopped. People need these things and the US is trying to shorten its belt. Now we are trying to get a healthcare system for the entire nation. Why was ours so bad before? The fact of the matter is that we need to not just save the world, but save our country. Look around us. Our communities is suffering. Our states are suffering. Our nation as a whole has some serious issues. We need to take care of them foremost. If there is no United States, how can we even begin to help others? This entry was posted in Blogging, Family, Jobs, Life and tagged Blogging, Emotional, Gas Prices, Health, Life, Making a Difference, News. Bookmark the permalink. This is a great post. You are so right. Thank you Fnky…. I am just going by what makes sense. Well said my friend. Beautiful post!